Well, steering a mouse with a joystick is perhaps not optimal, but here goes anyway. For this demo, you'll get to move around leaving a trail behind. No, it's not going to be another snake game. You accelerate and de-accelerate. If you hit the borders, you'll bounce off. Just like Parallax Starfield, you'll be able to form some pretty perfect circles, that is, if you know how to apply the right pressure(s) at the right time. And there's a bit of friction as well. As for the registration point of the mouse, I'm using the same original default from the Amiga Workbench 1.x. Edited by sometimes99er, Mon Jun 11, 2018 10:15 PM. This is really good! 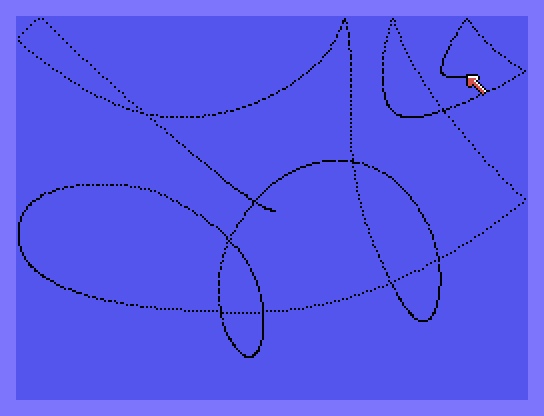 I love the inertia effect of the pointer, creates some nice siney-lines. Unfortunately I'm throwing away the demo drawing effect. Next level, graphic- and soundeffects. Game over and another short tune. All levels completed and a longer tune. Your creativity is absolutely astounding. Hehe. Thanks. - Well, get my flimsy ideas from all around, actually, but then I guess that applies to all. This game is quite minimalistic. There’s nothing much to it. All you have to do is hit the square. So why all the text ? For one I have to practice my Danglish. And so onwards along the path of wisdom. Slide the cartridge in your beloved Home Computer, the one that boots in no time, and then get a hold of your joystick. Press 2 to select the game. 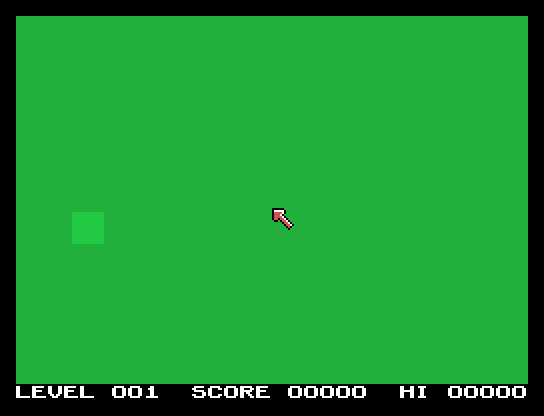 Now after an intro screen, you’ll have to maneuver a mouse pointer around the screen, and then try and hit a square. This probably takes some getting used to, but as you know, practice makes master. You hit the square using the fire button. You can slide in front of the square and hit fire just at the right moment. You might even utilize the bouncy bump, - when the mousy thingy gets edgy. The registration point of the mouse is the upper left of the white color of the pointer. Just as was default on the Amiga anno 1987. 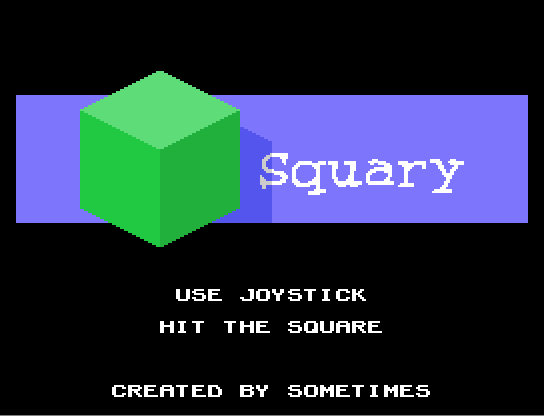 Each time you hit a square, a new square will emerge. The color combination will be different and often the square itself will get smaller. If you are quick to hit the square, you will be awarded a good number of points. If you wait around forever, your score may be as low as only 1 point. If you hit outside the square, it’s game over. Just like that. Theoretically you could get a high score of 1,900. But a score above 500 is more than okay. You can memorize the patterns at which the squares appear, and get closer to a super high score. 50 amazing and carefully balanced levels of immense tension. It was 100 levels, but my neck and shoulder told me otherwise. Click image if you want to make your own label. Another one for my next label order. . .
i got my score at 128 for 12 levels... i will try a bit still and build my cartridge soon it's an original game ! Edited by ti99iuc, Sun Jan 8, 2017 6:14 AM. For a strange reason, I feel a sudden desire to play Marble Madness. This is great. Nice Zero-Zap ditties ... I'm rubbish at it, but it's really cool! I went through all levels on MAME, Classic99 and JS99er, just to make sure the game did what it should, and my best score was 700 exactly. - I did test for 1 point scores, boundaries of hit zone, and may have been distracted, so 700 is by no means an effort, but sure, I did some nice sliding and bumping. Oh, never thought of that. The mechanics are there, so I should put something similar, like Marble Madness, on the list (of things to do). Thanks. Edited by sometimes99er, Sun Jan 8, 2017 6:46 AM. Yes, you got it. Bits from or nods to Zero Zap and Robotron (crash adjusted and made longer). Funny thing is that the game only got to just over 5,000 bytes with a lot of potential for compression in the pattern definitions. So all of the 4 sounds could have been much longer if not better. Then again, it all had to be a bit minimalistic, and the initial sounds kind of hung on. You must practice however, something with much the same controls is bound to come along. Edited by sometimes99er, Sun Jan 8, 2017 6:47 AM. Very nice and catchy game! Especially on real iron with a good joystick. I got 516 so far. Indeed, when memorizing the appearance of the squares, you get much more points! I guess it was the mouse pointer that brought that feeling. But yes, Marble Madness would be great! With tile scrolling? Makes me want to make more. Thanks. Yes, something like that. It will however not be a port as such, but maybe something that looks very much alike. I think someone was playing around with a Marble Madness demo, - was it Kurt or Rasmus ? Edited by sometimes99er, Sun Jan 8, 2017 9:25 AM. I like this one a lot! It should keep my boys busy too. I'll burn a test cartridge with it later today. I really like the Marble Madness idea too. That was one of the games from other systems that I really liked. The other one I really liked for some reason that never made it to the TI was Qix. I'll keep the Marble Madness idea in the back of my mind. And I've collected several ideas for stuff like Qix. Thanks. Time flies since more than 3 years has passed. Woh. And still an impressive demo. And if you allow for using the mouse with v9938 systems (80-col card or Geneve) or the Mechatronics mouse, this would be a dream come true. (You can use MAME if you don't have such a device.) Querying the mouse is not that difficult, it just means to read some video registers.